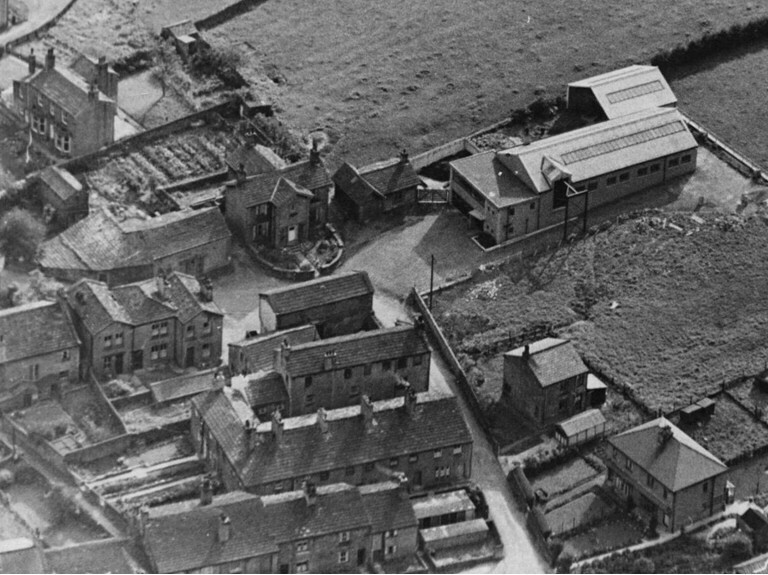 Aerial view of Low Fold, Sutton commissioned by Alan Green following completion of his new engineering works about 1956 (top right). Top left is Rose Cottage, our family home for 35 years. The small building below it was once a slaughter house but by this time it was occupied by David Coleman who stored and prepared potatoes and fish for his fish and chip shop in the King's Arms yard. David's sister Edith Coleman sold wet fish from the building on a Friday morning, both worked in clogs. There was no fridge and all the fish came in wooden boxes packed in ice, it also came with the skin on and Edith skinned it before sale or frying. 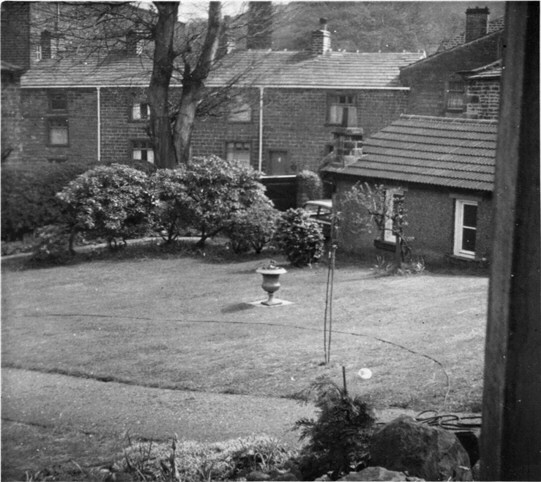 The large barn to the left of Low Fold House was occupied by Bob Ridsdale and from here he ran his van from which he sold fruit and vegetables around the district. Bob lived in the semi in the bottom right of the picture. The building facing the barn and Low Fold House was built by John Willy Hartley and was once part of Low Fold Farm (he also rebuilt the farmhouse), by this time it was used as a builders store and was heading towards dereliction. In the 1950s we played football, with tin cans, using the barn doors, which weren't quite opposite each other, as goals. The long three storey building between it and North Row was once a beer house called the Gardener's Arms, in 1956 Mrs Garnett (the late Clive Garnett's mother) lived there. The top storey of this building was a single room and accessed via external stairs, in the 19th century it had been a spinning shop and in the 1930's was used as a gymnasium. 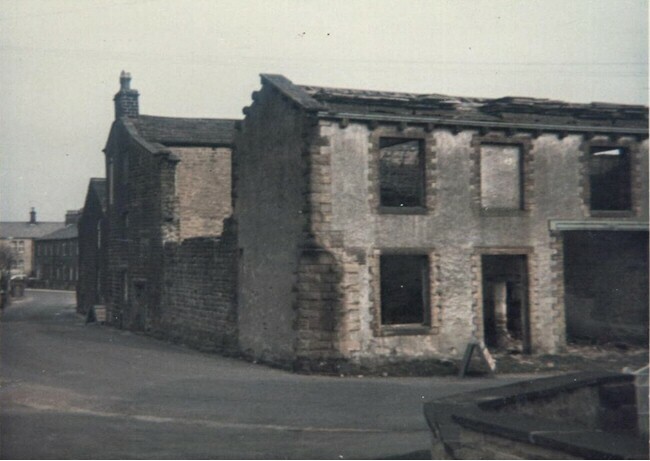 The building between Low Fold House and Green's Works was once the village smithy, also built by J W Hartley. It was built for Gill Ferguson to replace his former smithy which it is said was in such poor shape he nearly froze to death in it one winter. 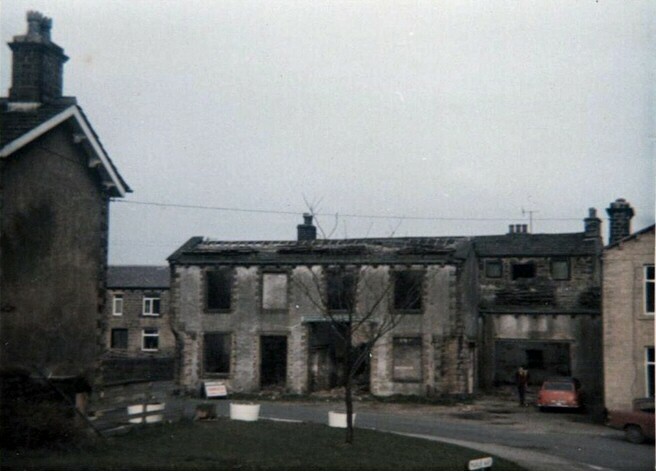 Low Fold about 1971 just prior to the demolition of the Hartley built farm building on the corner of North Road. The gable of Low Fold House is on the left of the picture. The old barn where Bob Ridsdale stored his van and goods had been demolished to make way for Manor Way and access to the new estate. The gable with the stack and chimney pot was once the Gardener's Arms. Prior to the demolition of the building the late Stanley Matthews and myself took the chimney pot off the stack, we lowered it into North Road tied to a clothes line! We did it in the early morning one Mother's Day and I gave it to my mother as a garden ornament. The entrance into the Gardener's Arms was through the door on the left of the photograph, this was accessed down a narrow passageway from a doorway in North Road. The external stairway led up to a long room on the top floor. 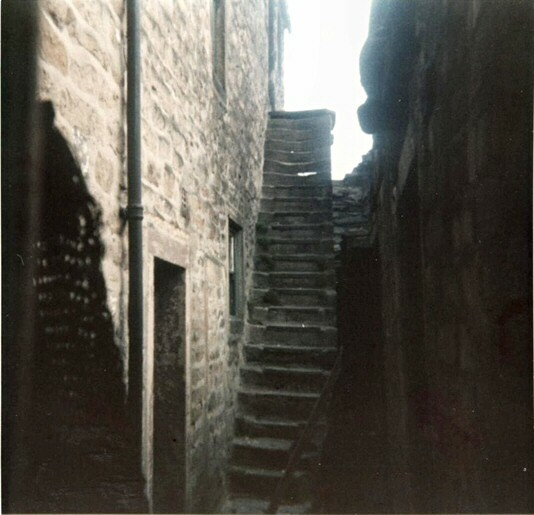 We always referred to the stairway as 'Kidnapped' after watching the TV series of the book by Robert Louis Stephenson. From the number of 19th century ink bottles that were found during demolition it is likely that the top floor was where Richard Petty ran his school in Low Fold before the National School opened. The Gardeners became notorious as the place where one Ned O'Caff's was last seen alive at the beginning of the last century. His actual name was Bottomley and he mysteriously disappeared after a drinking session one Summer evening. His body was found the following Spring at the bottom of the hay mow in the barn at Low Fold Farm (where Bob Ridsdale later kept his fruit and veg). The inquest concluded he had gone into the barn to sleep off his drink and covered himself with hay so as not to be discovered. Hay making was in process at time and the mow was unknowingly piled upon him as a result of which he suffocated. The tale was still running in the village when I was a boy with the usual rumour of money owed and foul play. I believe the Gardener's Arms closed its doors for good around the end of the Great War. I remember talking to Lilian Hargreaves, an elderly spinster who came from Steeton to live in the bungalows at Manor Way, she recalled spending her holidays helping at the pub when she was a girl. At that time it was kept by her aunt. There was no bar, the beer was kept in barrels on a gantry in a back room and measured out into pint pots from large jugs. As it was only licensed to sell beer there were no spirits available. The bracket from which the sign had hung was still there until demolition. 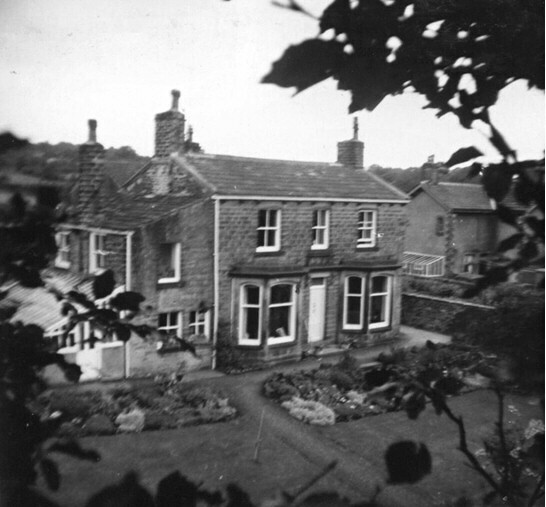 Rose Cottage as it appeared in 1956. The house had been built by William Thompson about 1874. He was the village joiner and undertaker but went into manufacturing the dobby, which controls the warp threads on a loom, and the lags and pegs associated with it. Eventually his two nephews went into business with him and it became W & J R Thompson (Woodturners) Ltd, known locally as the Lag Shop. The business ran from Rose Mount but in 1920 moved to the Vineries in Holme Lane, where it remained until recently. The part of the house between the greenhouse and the first bay was originally used as the joiners shop and saw-dust was still a problem when we lived there. The saw-dust used to fall through cracks in the ceiling into the kitchen below. When the house was built it was fitted with central heating, underfloor piping ran from a boiler house at the back of the house to radiators in the window seats of the two bay windows. The boiler house was pulled down soon after we moved in. The greenhouse was also heated and had its own boiler on the right as you went through the door. When William Thompson died he left the house, Rose Mount and the Coach House to his daughter, Annie, and her husband, James Laycock. They had no children and when Mrs Laycock died she left all the property to Alan Kidd, who had looked after her and managed the property for her. My parents bought the house from him in 1951. My late father, Derek Longbottom, is standing at the front of the house. At the age of 13 I climbed the beech tree which stood to the front of the garage to take this rather shaky photograph of Rose Cottage. The tree was felled as part of the road widening scheme when the Manor Way estate was built. The garden at Rose Cottage showing the beech tree from which the above photo was taken. The garage was built to house Jimmy Laycock's car, it had a mechanics pit, gas lighting and was also heated, hence the chimney. Iron gates from Towngate later replaced the wooden ones, I brought them down the village on a sack cart. 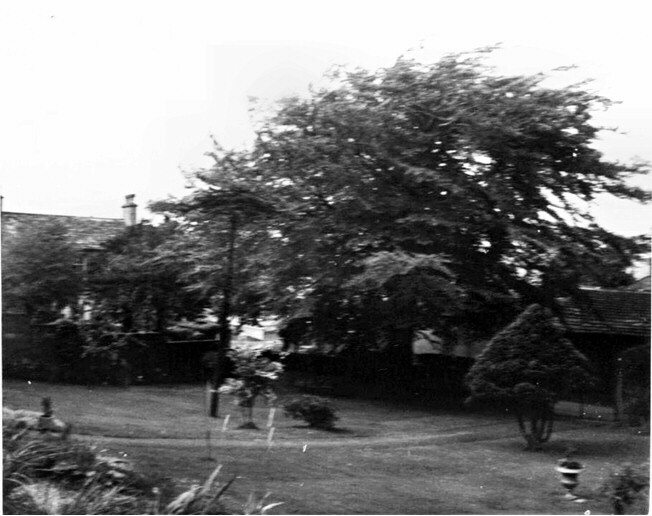 The garden of Rose Cottage before North Road was widened. The beech tree would have stood in what is now the middle of the road. Against the far wall was a gravestone to the memory of Jack, Pat and Mick, three English setters that had been Jimmy Laycock's gun dogs. Low Fold was a very close community when I was growing up. Prospect House (once the Hartley residence) the roof of which can be seen in the photo, was occupied by two bachelor brothers, Herman and Evelyn Davy. Their brother Leonard and his wife, daughter and her family (the Kings) lived at Low Fold House and another brother, Eshton Davy and his family lived on North Row. Their father was Wilson Davy at one time the blacksmith at Low Fold. Craven House next door to Rose Cottage was the home of Alec Kettlewell and family, his brother Jack and wife Isabel lived behind in a small cottage at Rose Mount and eventually another brother Leo and family moved into one of the cottages opposite the King's Arms. 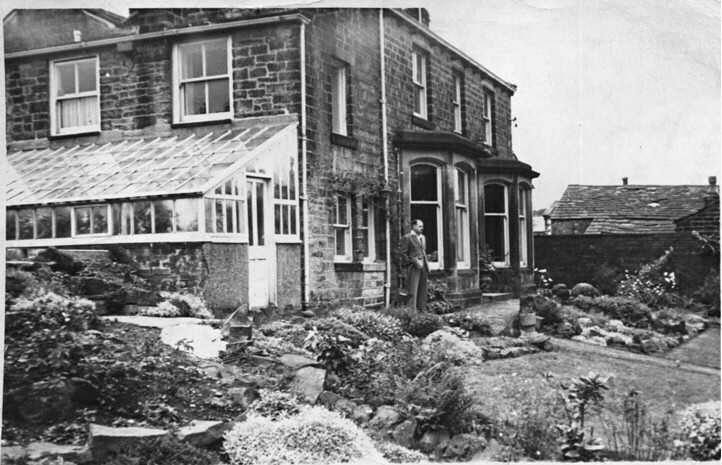 Herbert Sharpe and his wife lived opposite Low Fold House, his wife and Alec Kettlewell's wife were sisters. The landlord of the King's Arms was Harry Myers, the former village policeman. Although we had moved to Sutton from Keighley we were not unconnected to the village, my maternal grandmother had lived in Holmefield before the Great War and still had cousins in the village. We were also related to the Longbottoms who had first opened the King's Arms in Kings Court in 1830 before moving it to the present site. The Misses Longbottom, two elderly spinsters, were still living in Kings Court up to the 1960s and although it hadn't been a pub for over a hundred years they still referred to the building at the back of it as the 'brewhouse'. The King's Arms bar 1969. John Wilson on the left, who for many years delivered coal and fuel from the coal yard down Sutton Mill. On the bar are two pints of Bentley's Yorkshire Beer, brewed at Woodlesford near Leeds. The brewery was bought out by Whitbreads and ceased brewing in the early 1970s. When electric beer pumps came into vogue the King's Arms was the only pub in the district to retain the old hand pumps. The pub did a good trade during the Three Day Week of 1974 when electricity cuts stopped the beer flowing at the Bull and Bay Horse. I recall that during the cuts the King's Arms was lit by tilley lamps and candles and the Bull by oil lamps. 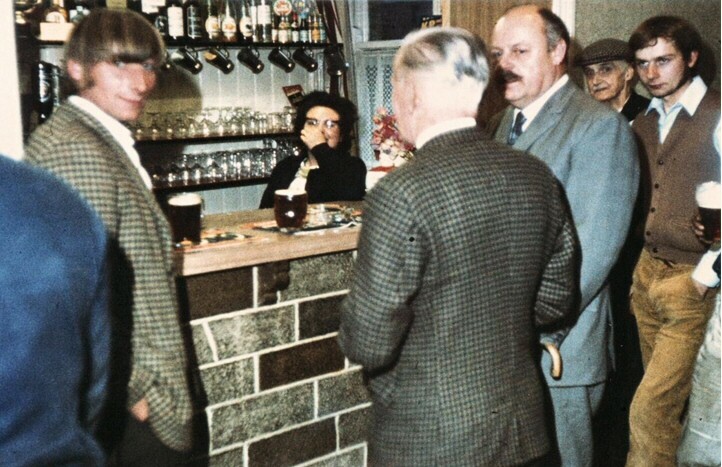 Behind the bar is Dolly Myers and with his back to the camera is Joe Harry Haigh, landlord of the Bull who is obviously on a mission to check out the competition. My father, Derek Longbottom, is next to Joe Harry, he often said, when referring to Rose Cottage, that it had taken him years to find a house with a pub at the bottom of the garden. In the background in the flat cap is old Charlie from the cottages across the road. Charlie was an old publican having kept or grown up at the Ship Inn at Kildwick (now long gone) and been for many years the landlord of the King's Head in South Street, Keighley. Charlie never drank pints, he would start with half a bitter, top it up with a barley wine (strong ale) and top that up with a large gin. He called the concoction a dogs nose. I am standing on the right of the picture. The King's Arms was known locally as 'the Nook'. In the 19th century it was owned by the Longbottom family and by 1890 it had passed to Spencer Walton (a grandson of William Longbottom). After Spencer's death in 1893 his widow, Mary, married Wainwright Smith who in a moment of mental instability piled up all the furniture in the tap room and set fire to it. Fortunately the pub was not burnt down and the Smiths left soon after to live in Glusburn. By 1901 it was being run by Joseph Sutcliffe. Low Fold. The King's Arms is shown right with Rose Cottage marked in the ownership of Mr W Thompson. Marked with a number 10 is Low Fold Farm before the alterations made by John Willy Hartley. Prospect House, the Hartley residence, has the enclosed garden to the front and coach house and stable block to the left (now three houses). North Row is marked in ownership of Mr J W Hartley and the Gardner's Arms is annotated with a name that is unreadable. Plan dated 1886. The King's Arms in 1894 and occupied by Mrs Wainwright Smith. Manor Hill, coloured pink, was built by the Walton's (descendants of William Longbottom) on the croft belonging to the Inn. William (Bill) Walton married Harriet Longbottom and ran the Croft Mill in the High Street. With thanks to Robin Longbottom for providing the text and images. November 2010.